If no two feet are the same, why should two shoes be the same? Thanks to the LUCK FIT you can customize your shoes to your foot size, last shape and metatarsal width. This corrects different foot size, varus, valgus and instep problems. We manufacture a different shoe for each foot, so preventing discomfort and injuries. Increase your performance by up to 20% and reduce fatigue thanks to shoes that fit you like a second skin. Taking your measurements is very easy. Just follow these steps and if you have any questions, please contact us. Put a sheet of paper against the wall. Put your foot over it and the heel as close to the wall as you can (measure it by throwing all the weight on the foot with sock). Mark with a pencil to where it is your longest toe (the sheet and the pencil must do a 90 angle). Fulfil the measurements you took of each foot in “MY MEASUREMENTS” for knowing your proper shoe size. 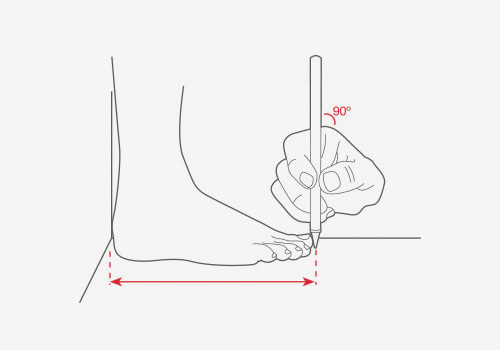 Use a tape-measure to measure the outline of the instep (base of the tibia and hollow of the foot arch). Close the measuring tape without compressing. Ensure that the foot does not move in comparison with the outline tracing. Fulfil the measurements you took of each foot in “MY MEASUREMENTS” for knowing your proper shoe last. 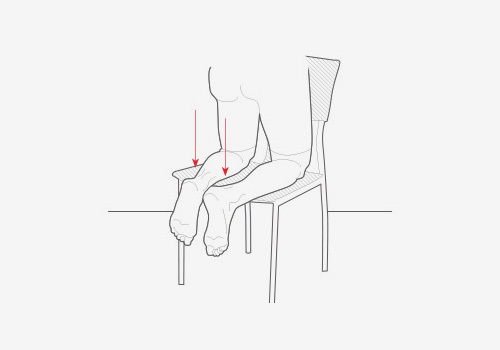 Place yourself on a chair with your legs and feet forming right angles. Hold your knees on the chair leaving your feet pending. By the help of a second person, take a picture of his feet as viewed from above. Send the picture to eshop@luck-bike.es and our team will determinate what varus/valgus degree you have. Now you can introduce your biomechanical correction into the “Fitting-System” models. With the help of a piece of paper and a pencil, put your foot on the paper and mark the two ends of the metatarsus with your pencil. Pencil and paper should form a 90º angle. 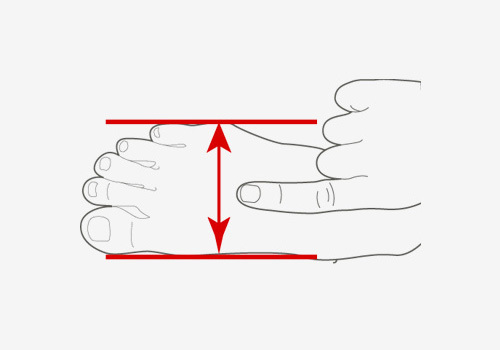 Then measure the straight line between the metatarsal bones. If in doubt, scan the image and send it to us to eshop@luck-bike.es. When making your order, all you have to do is put your measurements into any of our LUCK FITTING-SYSTEM models.